Amplify faint or distant sounds with our Bionic Ear and Booster Set. Listen by pointing the unit in the direction of sounds up to 100 yards away. The set comes with a 12" parabolic dish and has a recorder output jack to record the sounds picked up by the Bionic Ear. Extreme Powerful Bionic Ear Designed for spy, surveillance, security, hunting, wildlife observation, law enforcement, militia, search and rescue, spying, camping, outdoor adventure, and much more. Utilizes superior sound direction and amplification, with recording capabilities, and adjustable volume feedback. Unit has auto safety shutoff. The extreme Bionic Ear puts other eavesdropping devices to shame. With this powerful listening unit, you can listen to anything from up to 100 yards away. For years this has been used by law enforcement personnel and wildlife enthusiasts. Powerful yet compact, this high quality portable audio surveillance equipment will guarantee you never miss a sound. For outdoor enthusiasts, the Bionic Ear Booster can be used to locate wildlife that cannot be easily heard with the naked ear. For those seeking sound amplification devices for investigation, the Bionic Ear can be used to listen in on conversations covertly and out of sight. The Bionic Ear is also a great replacement for conventional hearing amplifiers. Can be used by the hearing impaired at sporting events, concerts, speeches and more. 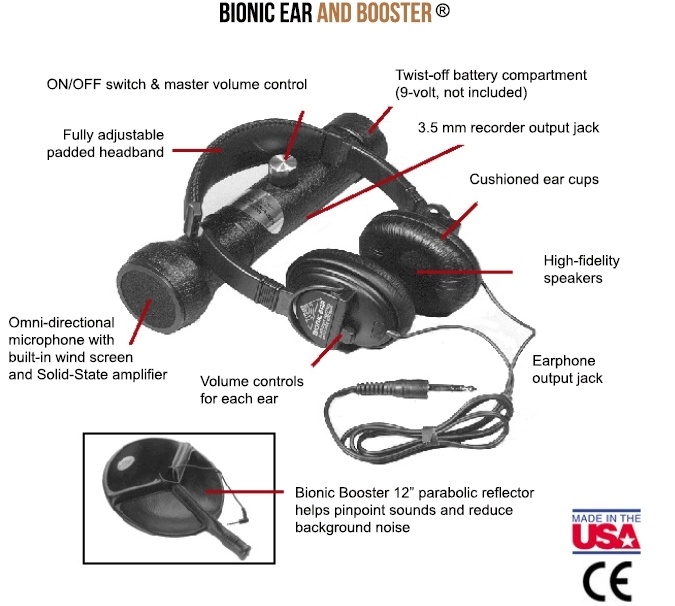 The Bionic Ear and Booster is powered by a single 9-volt battery. Device is capable of picking up audio from up to 300 feet away, and is equipped with an output jack that can be used with an external recorder to record the audio evidence you capture. Bionic Ear has an automatic safety shut off at 95 decibels to ensure there is no unpleasant sounds or damaging high volume to ear. Unit includes a one-year manufacturer warranty, therefore you can be rest assured that your purchase will work out for you as anticipated. Expensive but worth the investment. Picks up sounds I never expected to hear. Can only use in outdoor open spaces. Wish I knew about this sooner. Thanks for such great product!